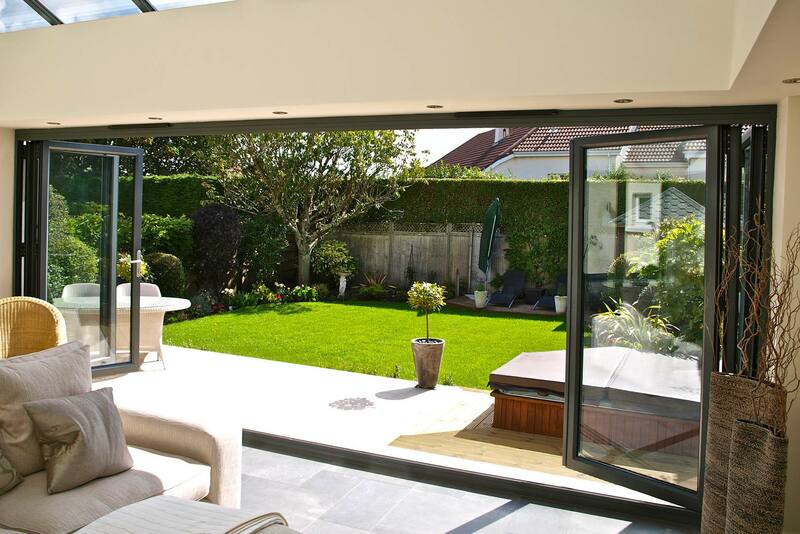 If you want to instantly modernise your house then bifold doors are the answer. Their slim profile and flexible usage makes them a ‘go-to’ product for many modern conversions. They are also a safe option and very secure, having multiple locking points, whilst conventional doors often only have a single locking point. In order to install a bifold door in your home you need a company which you can trust to know the product and which will give you a good service. Camberley Glass and Windows is a local company which has been working in the Bagshot area for almost 50 years. We are proud of the reputation we have developed over that time as being a very professional company which develops a special relationship with its customers and gives a high level of customer care. It is no coincidence that much of our business comes from personal recommendation. Our extensive range of bifold doors are available in different materials, colours and textures. All our doors are manufactured to exceed British Trading Standards which means that there will be minimal heat loss and maximum noise exclusion together with a high level of security. In addition our bifold doors come with full guarantees. Our team is fully qualified and FENSA registered, so you can be sure that we will provide you with the best advice available. We can help you with your choice of door and if you wish can do a survey and give you a quote. We would advise that your door be professionally fitted, and our team of skilled fitters are very efficient. You can see testimonials from our satisfied customers on our website and our high ratings on Checkatrade. We are also on the Buckinghamshire and Surrey Trading Standards Approved list of traders. If you would like to visit our showroom at our offices in Camberley, Surrey, we would be delighted to to see you and show you our wide range of bifold doors. We would also be happy to answer any questions and provide you with brochures on different products.